A month ago we had Rob at ROAM shop in Nelson fit our alpine touring boots with some custom-molded Sidas insoles. 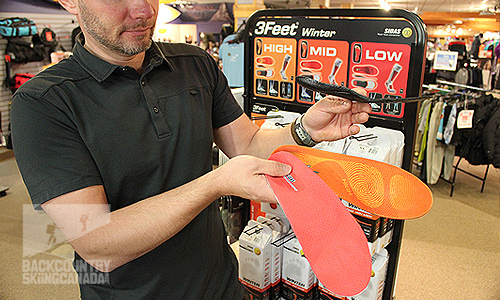 We also tested out Sidas Winter 3Feet off-the-shelf insoles for comparison. If you were an elite athlete where all your gear had to be dialled, fitting custom-molded insoles for performance is a no brainer. But for backcountry skiing? Is it an upsell/an add-on? What are the benefits? 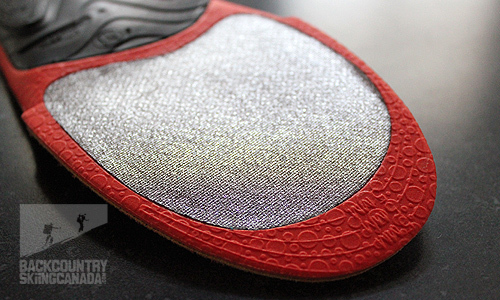 If it's not an upsell, why Sidas when there are so many other insole manufacturers out there? Let's start with the last question. 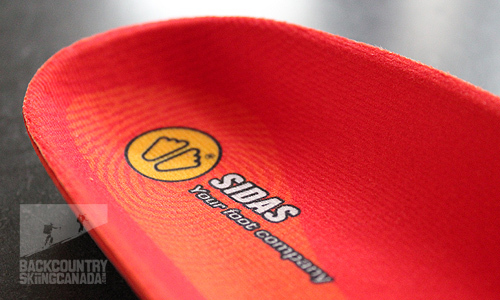 Sidas have been in the foot bed market for almost forty years, they started out developing solutions for foot comfort while skiing. If you go to their site these days you'll find that they offer foot comfort and performance solutions for the gamut of sport activities and feet types. According to Sidas they work closely with chiropodists, pedorthists, engineers, doctors, biomechanics, osteopaths, elite athletes … you gettin' the feel for it? So, they do their homework and they have been in the game for a long time now. 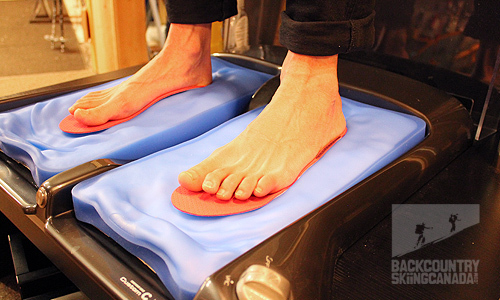 There is some real science behind their footbeds, in particular for skiing. Now, let's talk a bit about feet. The human foot has 26 bones, 33 joints, 107 ligaments, 19 muscles and tendons. With both feet combined the 52 bones make up about 25 percent of all the bones in your body. No one foot is the same, just like our bodies they come in all widths, heights, volumes, lengths, arch-heights, toe lengths … you get the idea. On top of this the alignment and health of your feet will impact every joint above it, in particular your knees, hips, spine. 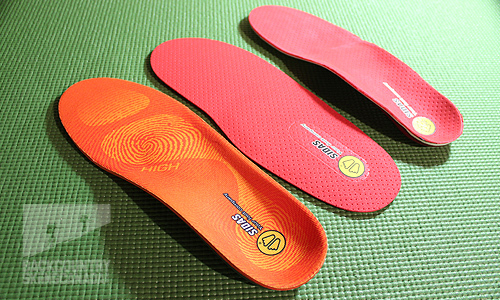 This is why Sidas claim that their insoles help you to prevent or decrease foot, knee, heel and back pain. So, despite a good boot fitting and molded liners, you will have gaps or corners around the perimeter of your foot. For skiing this could mean a lapse between the movement of your foot to initiate a turn and the equipment on your feet responding to that movement. Unfortunately on top of that, the foot could have other gaps under foot, particularly around the arch depending on the height of the foot arch, this results in more foot movement within the boot and generally a sloppier, less supportive and less comfortable fit. 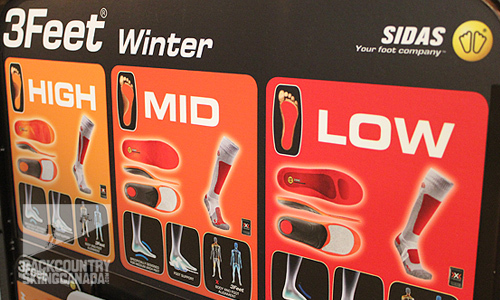 Choosing the right insoles are a crucial addition to a great boot fit. For performance, you want your foot and the boot to be one, so the boot is a cast of your foot—no gaps. For comfort, you need cushioning and support. This second point is even more relevant to backcountry skiing since you'll have days where you are walking in those boots the entire day. So why don't AT boot manufacturers design boots that resolve this? First of all, they want to keep costs down, and secondly, no two feet will fit the same mould. 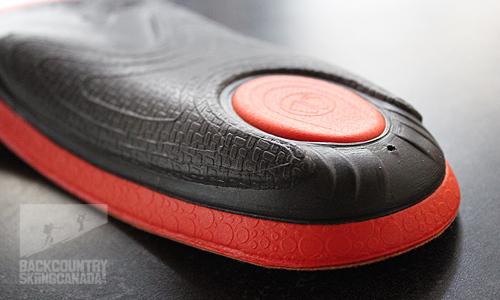 Here you can see a stock liner copared to the Sidas insoles, it's not much more than a thin layer of foam. Sidas offers two categories of ergonomic insoles that are designed to resolve the lack of foot support in ski boots—off-the-shelf and custom. The off-the-shelf Winter 3feet Insoles are ready to wear out of the box and come in low-arch, mid-arch and high-arch support options. as well as an aluminum film under the forefoot that acts as a radiant heat barrier to improve insulation. These insoles are pre-shaped using a harder material combined with firm foam to provide support and to eliminate the gaps around the perimeter and underneath your foot, so if you are within the range of an average foot then these might be enough for you. A step up from the Winter 3feet Insole, the Sidas Winter Custom Pro Insole is the premium solution for supporting your feet in ski boots. These flat 100% customizable insoles require in-store specialists to assess your foot, take a footprints directly from your feet, then morph and grind the insole to your unique foot shape as well as your boot liner. Below from left you can see the Winter 3feet Insole, the unmolded Custom Pro Insole and the finished molded Custom Pro insole. The custom solution is optimal for filling any gaps that may exist between your foot and the boot, therefore offering the most precision and support. The Custom Pro version has an additional double-layer stiffer material for added support as well as a construction that is designed to be dynamic with the action of the foot. Once the molding is complete and the insole has hardened the technician has to grind the insole down to finish the edges and to fit perfectly into the boot liner. This part requires the most talent. To see the custom insole fitting process in detail check out our video of Rob from ROAM shop fitting a pair. If you are not in this neck of the woods check the Sidas website for to find a store near you that specialises in this. Also worth noting is that the insole can be recast to fit another boot if you upgrade your boots at a later stage, though this will depend on the mastery of the boot fitter. One other product you should also know about from Sidas (they have many unique ones) is the Sidas Hotdryer. 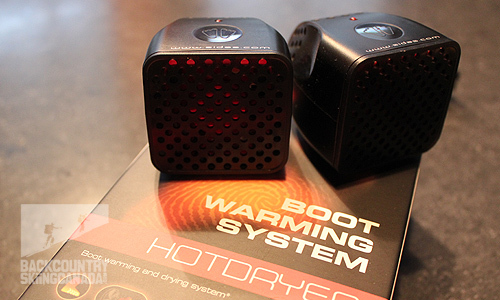 This is essentially a portable boot warmer and dryer. Plug it into your house outlet or your car's 12V outlet and you can either pre-hear your boots before a ski tour or dry them after use on the drive home. 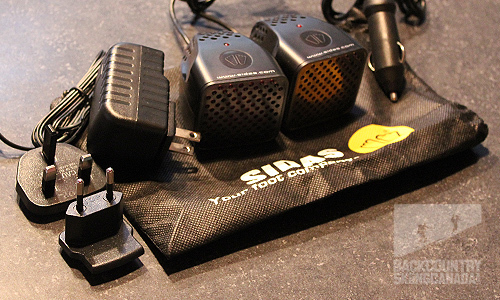 The Sidas Hotdryer is a mini heater that blows hot air into your ski boots, shoes or even gloves - they are pretty small so they fit into your boots right up to the toe box. I have started using this product to dry my ski boots on the drive home to prevent that funky smell you get in your liners after a solid season of ski touring. For $79.95 you can keep your liners dry and they should then last you a lot longer! I knew the manufacturers stock insoles were cheap and lacking but it's not until I compared them to one of Sidas' Winter Insoles that I really felt what I was missing. It's like feeding your dog wet dog food after it has had dry all it's life—your dog won't want to eat dry dog food again. I will always invest in insoles for my boots from now on and Sidas would be a brand I would trust for this. 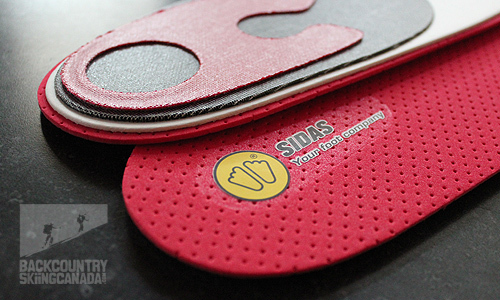 My experience using Sidas insoles trumps any other insole I have tried in ski boots to-date. 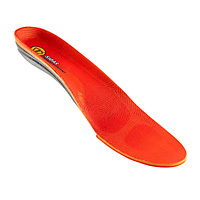 They have years of experience and research behind their insoles. Going for the premium option of custom moulded insoles will depend on how much you are in your ski boots and what sort of shape your feet and body are in. 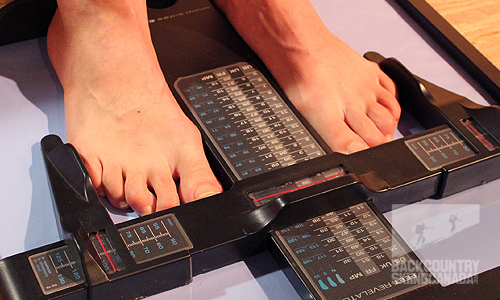 A foot assessment by a Sidas trained specialist will help determine this. My feet aren't in bad shape, in my foot assessment with Rob I found out they lack flexibility and the arches are a little low but I have never had any painful conditions and they aren't too deformed. Also I don't have any knee, hip or back problems (I don't want any that may result from poor alignment another good reason for insoles). 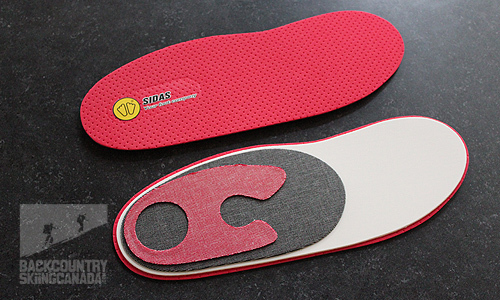 I could probably get away with the off-the-shelf Winter 3Feet insoles from Sidas, I felt they offered a remarkable improvement in comfort and fit compared to the manufacturers stock insoles I had been using. I would highly recommend these if you don't have the budget for custom molding. However, if you spend a lot of time in your boots and can make the investment Sidas Custom Insoles are by far the best solution. They step it up a notch in fit so the feel is seamless. When skiing, I felt that my feet moved less in my boots as I turned, I could lay over on an edge more easily, though we're talking subtle here, the harder you ski the more you would notice it. I ski in touring boots all the time, in and out of bounds, and I felt adding the custom insoles to my boots was great way to enhance the fit/performance in a softer/lighter boot, achieving more of the performance fit I would find in a downhill boot. In walk mode they also felt noticably more comfortable. The other tester had higher arches than me and he was more impressed than I was with how the insoles enhanced fit. Some people will benefit from this more than others, for those whose feet are unique (messed up) or sensitive in any way custom moulding is the only way to go. Price: $45CAN for the Winter 3Feet pre-moulded insoles and $200 for the custom moulded insoles (which includes up to an hour for assessment, moulding and fitting). Enhanced fit, performance and comfort. Optimised foot support encourages better alignment in the joints from the feet up. The quality of custom molding, particularly how it is fit to your boot, is reliant on the mastery of the technician/specialist.